In the winter of 1942, the German and Russian Armies meet in the great Battle of Stalingrad, one of the most murderous and critical engagements of the Second World War. 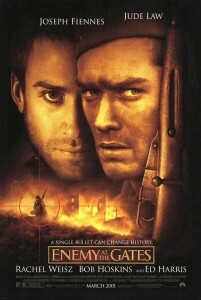 Enter into this horror a young Russian soldier, formerly a peasant boy with an extraordinary ability as a sharpshooter. The Russian sniper soon gains fame after killing a record number of German officers causing the Germans to bring in their own master sniper: a war weathered Major who always accomplishes his mission no matter what the cost. With the Battle of Stalingrad raging around them, these two men must now fight each other. And this is a real story. With even a true (and moving) romantic sub-plot thrown in! Surely Academy Award material, you would think? But Jean-Jacques Annaud manages to squander such genuinely epic material as he did with Seven Years in Tibet. Bad casting, bad script, and a complete inability to move beyond usual Hollywood stereotypes. Still some amazing battle scenes, and great moments with Bob Hoskins chewing the carpet (and drapes) as a brutal Khrushchev, chief political commissar of beleaguered Stalingrad. For more details, see tt0215750 on The Internet Movie Database.